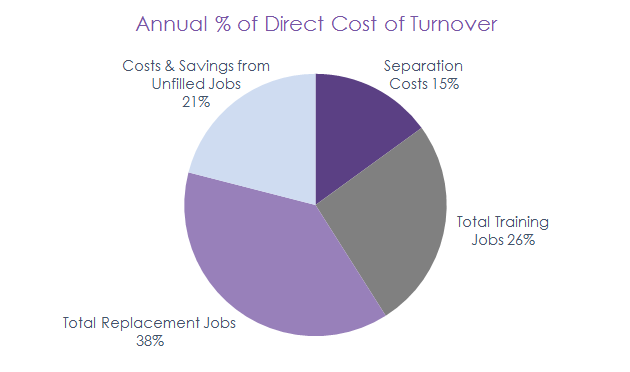 Do you know the cost of employee turnover at your company? Most executives are familiar with the direct costs of replacing an employee. Interviewing, new hire processing, training, benefits, are only a few of the easily identifiable costs that quickly add up. What many people don’t know is that those direct costs amount to only about one-third of the total cost of employee turnover. 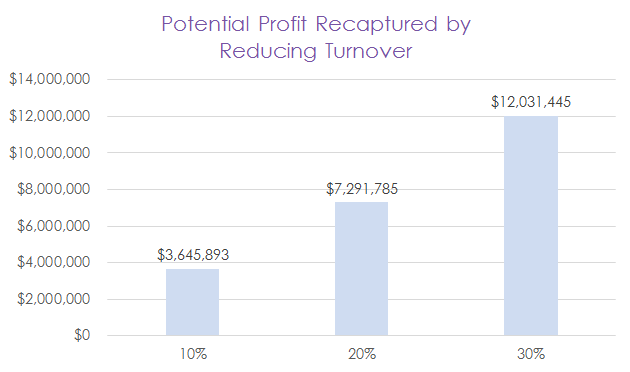 Retensa’s Turnover Audit expands on the standard cost of turnover calculator to precisely calculate both direct and indirect cost of turnover. 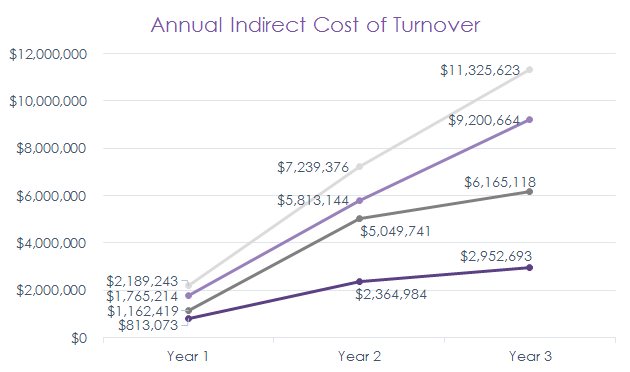 Our Cost of Turnover Analysis segments indirect costs of turnover, such as lost productivity, performance differences, and losses and gains from unfilled jobs. We use your company’s specific information (not estimates) to deliver the most accurate assessment available. Additionally, we built a turnover model that is industry-specific and customizable to your firm’s operation. You can compare locations, positions, even business units. It is so comprehensive because we spent over 2 years and 4800 hours to produce the most powerful and accurate turnover model ever created. The result is a series of bottom-line driven metrics and costs which serve as indisputable benchmarks of employee retention issues important to you and your management team. If you want or need to know how much your company is losing as a result of turnover, Retensa’s Turnover Audit team would be glad to help. Through our Turnover Audit, you will receive a detailed report and analysis on all the costs that result from turnovers. We will provide an extensive summary of all metrics associated with turnover and a cross sectional analysis and benchmarks that allow for comparisons across firms in the industry by providing both quantitative data and qualitative analysis. This is delivered in an easy-to-understand report summary with layers of graphical charts. To present an executive-level visual comparison of your cost of employee turnover, we provide graphs and charts developed directly from your firm’s data. This quickly illustrates trends in the total Cost of Turnover and differences in key HR metrics over time. You can even apply historical data to see organizational performance from the previous 36 months. Are you interested in a Turnover Audit Pricing to Jump Start your Retention Strategy? You can expedite results and get your report in just 10 days.